This summer at Risen Life Church we are hosting several churches from around the country to do ministry alongside us in Salt Lake City, UT. If I had to describe Mission Utah it would be a very interesting recipe; part mission trip, part cultural immersion, add education on Mormonism, a few dabs of revival, part conference, sprinkled with some fun in the mountains. Our whole goal with Mission Utah is that participants would come here to experience evangelism and missions in a way that would inspire them to go home with renewed eyes and ears for spreading the Gospel in their hometown. 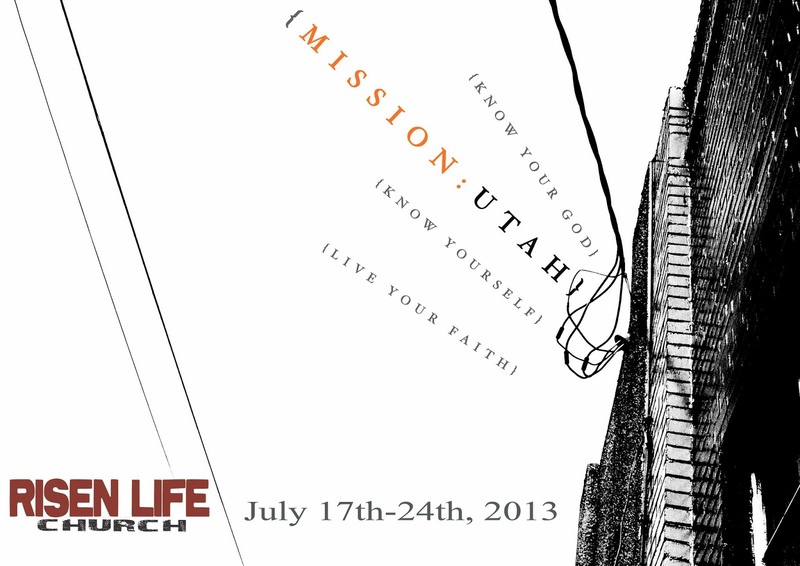 There are two ways to experience Mission Utah: 1) A Week Long Mission Trip 2) A Weekend Conference. Week long participants will stay at Risen Life Church. The week will kick off in different education opportunities on Mormonism as well as visiting significant cultural sites in Salt Lake City. We will also enjoy worship together as well as preaching from the word every night. As the week progresses it will begin to morph into a mission trip with evangelism and outreach to the lost of Salt Lake City. Their will be service projects, street evangelism, and engagement with the unreligious of our city in some interesting ways. Check out this video to hear more about the week. The weekend conference will be held at Risen Life Church. Our goal with the conference is to get many of the local Christians in Salt Lake City and those from around the country interested in ministry to Mormons together to learn about ministry to our culture and help stoke the flame to reach our city. At the conference on Saturday we will hear from people who are engaged in particular ministries to Mormons and hear from those that are planting churches in the Wasatch front (Salt Lake City and surrounding areas). These learning times will be surrounded by fellowship over meals, worship and prayer together, and preaching. After the Conference on Saturday, there will be opportunities to join Risen Life Church as we do evangelism later in the week. The cost for the conference is only $15. Check out this video to hear more about the weekend Conference. Guest speakers at the conference include: Sandra Tanner (Utah Lighthouse Ministries), Ross Anderson (Alpine Church), Dr. David Rowe (The Vine Institute), and Randy Sweet (Mormonism Research Ministry). Church Planters at the conference include: Adam Madden (Christ Fellowship), Bobby Wood (Redemption Church), Shawn Bagley (Gateway Community Church), Brent Captain (Salt Christian Church), Travis Fox (Grace City Church), Jason Benson (Real Life Church). 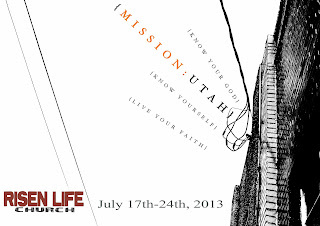 We are very excited about this focused week of outreach right in our own backyard. I hope that you will join us! Please also take a look at Salty Believer where Bryan Catherman has given his take on Mission Utah as well.